Our search for a travel trailer started in the beginning of 2010. We wanted to take some time off to travel all around Oregon, and decided to get a little travel trailer for this adventure. Since we didn’t have a big driveway, we needed to find a trailer no longer then 14’. 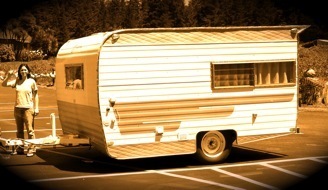 We always dreamed of owning a vintage Shasta, so that’s what we started looking for. Our budget was very limited and we wanted a trailer that would need little to no work. Well, as it turned out, after months of an unsuccessful search, we spotted an ad on Craigslist.com of a little vintage Cardinal trailer for sale close to where we lived. We immediately went to take a look at it, and even though it was not what we were originally looking for in anyway, (it wasn’t a Shasta and it also needed a lot of work) we thought it to be a very cute little thing that we could transform into our home on the road. We only had 2 months to work on it before the trip, so the clock was ticking. This was our first time restoring a trailer, and once we started inspecting the damage and realized the amount of work we had to put into it, we thought: “what did we get ourselves into?”. Of course, it was too late for regrets, so with our best attitude and a lot of positive thinking we decided to get down and dirty. This was going to be a labor of love. The first thing on our list was to find information about how to actually do all the repairs that needed to be done. The trailer had a lot of water damage in the rear, to be more specific, the rear wall (structure and paneling)needed to be completely replaced. We, of course had no idea on how to do this. At this crucial moment, we were blessed to find Larry’s website. Through his videos first, and phone calls later, he literally walked us through the whole restoration process. This even gave us the confidence to take the restoration a bit further, not only by restoring the whole rear wall, but also by replacing the whole inside paneling to new, creating the space we had been dreaming of. We also wired the whole trailer to be off the grid, replaced the axle and the hitch. We worked very, very hard and went way over our original budget, but in the end, we were able to complete the restoration in the two month time, and ended up with a practically “new” little Cardinal trailer that we can call our home away from home.